Be the first to share your favorite memory, photo or story of Dominic . This memorial page is dedicated for family, friends and future generations to celebrate the life of their loved one. 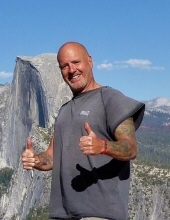 Dominic Bonarrigo, age 56 of Northbridge, MA and formerly Holliston, MA beloved husband of Linda M. (Paquette) Bonarrigo, passed away at home surrounded by family on January 28, 2019 after a courageous battle with Pancreatic Cancer. Born in Boston, Dominic was the son of Dominic F. Bonarrigo of Holliston and the late Anneliese (Wita) Bonarrigo. Dominic was raised in Holliston before moving to Northbridge with his wife 32 years ago. Dominic attended Wentworth Institute of Technology from which he later went on to pursue a career with Intel Corporation from which he retired in June 2016. He was currently employed as a Manager for Fuji Film Electronic Materials in North Kingstown, RI for the past two year until his passing. Dominic was an avid adventurer who loved all things of nature. He loved all creatures big and small. He enjoyed traveling, hiking, kayaking, boating and spending time with his family. He was passionate about sharing and including others in his adventures but was just as happy to pursue them on his own. Dominic mostly just loved “Life” in general and managed to live his to the fullest with the time he had been given. Dominic would often say “Live for today for tomorrow is not promised, live like you’re going to die tomorrow, and learn like you going to live forever”. Through his lifetime Dominic has helped and touched many and will be missed dearly. Besides his wife and father, Dominic is survived by his sons, Rick Soly and his wife Laurie and Michael Soly and his wife Kristin all of Billerica; his grandchildren, Jocelyn and James Soly; his sister, Andrea Meade of Bellingham and niece and nephew, Dominique and Anthony Pacitto of Bellingham. A Celebration of Dominic’s Life will be held at a later date in the spring. Memorial contributions may be made to the National Pancreatic Cancer Foundation, P.O. Box 1848, Longmont, CO 80502. "Email Address" would like to share the life celebration of Dominic Bonarrigo. Click on the "link" to go to share a favorite memory or leave a condolence message for the family.